ICARE is pleased to release this new high performance scale glider, a gorgeous all ARF sailplane, suited for thermal flying as well as aero-towing or slope. With a span of 4.3 m this almost 1:4 scale Ventus 2cxM is one of our finest Super Scale gliders. The cockpit comes completely finished, upholstered seats, and many scale details such as instrument mushrooms complete with instruments. The canopy is finished, fitted and painted. All that remains for the builder to do is add a scale pilot for complete realism. -M is for motorized version, which is the self launchable, completely autonomous version of that Ventus. The retractable unit comes pre-installed in the glider. The kit is available with sheeted and covered wings. All control surfaces pre-cut and hinged ready to hook up controls. It features a modified RG15 airfoil which gives this fine model a smooth and versatile flying characteristic. This model is comfortable on a slope and can be winch launched, but is at it’s best when aero-towed or with a self launch system. The neat wing planform gives it exceptional thermalling performance and the wings are very strong to withstand some strong aerobatics. Like its full-scale counterpart, the poly brake wing plan with winglets form looks especially graceful and unique in the air and gives a very smooth handling. With the level of completion of this glider, only a few hours of work are required before it will be ready to take to the air. The wings and control surfaces are Oracover covered completely finished. Airbrakes are installed and ready to be connected to your servos. Functional retract is installed in the high gloss, gel coated fiberglass fuselage. Rudder and Elevator a hollow moulded. All servos wires are installed. A small package of hardware and building instructions complete the kit. The self launch unit comes pre-installed, it features a fully automated retractable unit with a brushless motor and folding prop assembly. 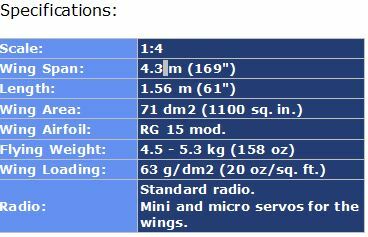 Radio requirements are four micro servos for the ailerons and flaps, two mini servos for the airbrakes, two sub-micro servos for the winglet ailerons and four regular servos for the elevator, rudder, retract, and tow release.